Let us first define what is WordPress? WordPress one of the most prevailing platforms available for making a blog or a website. WordPress is an open source content management system that is free of cost and it is built on PHP and MySQL. Features of WordPress include plugin architecture and template based system. It is possible to customize WordPress and with the toolkit that WordPress offers attractive websites can be created in less time. WordPress due to its clean code is seo friendly among search engines and this is testified by the fact that currently more than 60 million websites for blogging platform use WordPress. The initial release of WordPress was on May 27, 2003, by its creators, Matt Mullenweg & Mike Little as a fork of b2/cafelog. WordPress software was released under the GPLv2, GNU General Public License from the Free Software Foundation. The plugin architecture of WordPress permits the users to extend the functionality and features of a website or blog. WordPress encourages developers to yield a plugin either free of cost or funded, to the depository and is subjected to a manual review. At WordPress.org primary support for WordPress is obtainable; the others include WordPress Forums and an online community of WordPress users. The future of WordPress as stated by its co-founder Matt Mullenweg is in mobile, social and as an application platform. Did you know that permitting users to register for your WordPress website can also invite spam users to register on your site? While one can combat spam user registration similar to comment spam, wouldn’t it better if one could just regulate user registration like comments? Firstly install and activate the plugin i.e. New User Approve plugin. This plugin works wonderfully well and can self-configure. Which means one does not have to make any setting to get this plugin working. 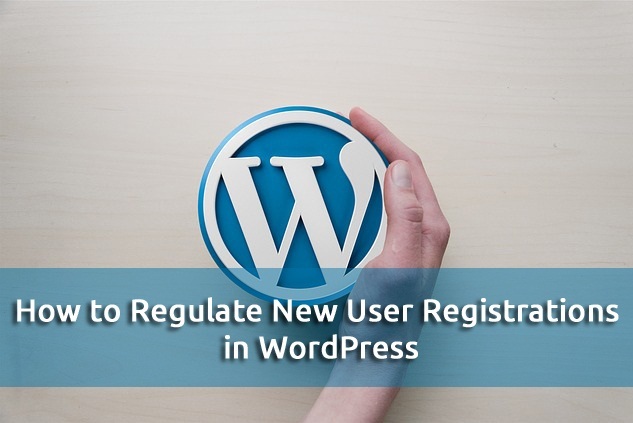 To view this plugin in action, one must log out the WordPress website and visit the registration page. 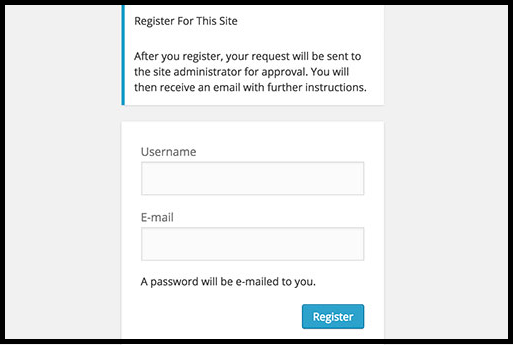 On the registration page, the users can see a notice informing them that their request for registration is waiting for approval of the site administrator. 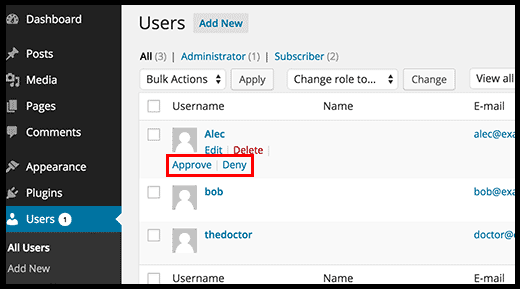 After the user request is received, the administrator in the WordPress dashboard admin area can either approve or deny the registration request. When the new user request is approved the user receives an email which contains the login credentials by which the approved user can login to his user account. If the user request is denied then that user is notified that the registration request has been denied. Note: when a user is denied registration this denial will not delete the user from the database. The denied user cannot login to the website and is not able to register again using the same username and email id. If the admin will delete the user, then the system will permit the user to once again register the on the website. The admin will still have to approve the user before the user can access the websites. A quick summary of the WordPress registration procedure with the New User Approve plugin after its activation. The user registers to gain access to the website. The user is notified with a message pending approval. Admin is informed of the new user Sign-up by email. Admin accesses the WP-admin to approve or deny the access request by a new user. Users are updated about their approval status via email; approved user receives login details in the same email. The user can login to the website using the login details.